Weed management tools can be divided into three main categories: mechanical, cultural, and chemical. Historically in conventional systems, chemical control options, or herbicides, have been relied on heavily. Weed emergence is driven by a number of factors, including temperature, light, nitrogen, and/or chilling period, depending on the species. Giant ragweed is one of the earliest emerging weeds, with an emergence period of only two to three weeks. As shown in Photo 1, soybean planting date had a significant impact on giant ragweed density. 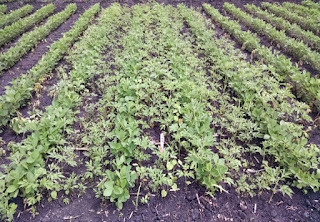 University of MN trials at Waseca in 2016 showed that delaying soybean planting until May 19 resulted in pre-plant tillage removing nearly 49 percent of the giant ragweed that emerged over the season. 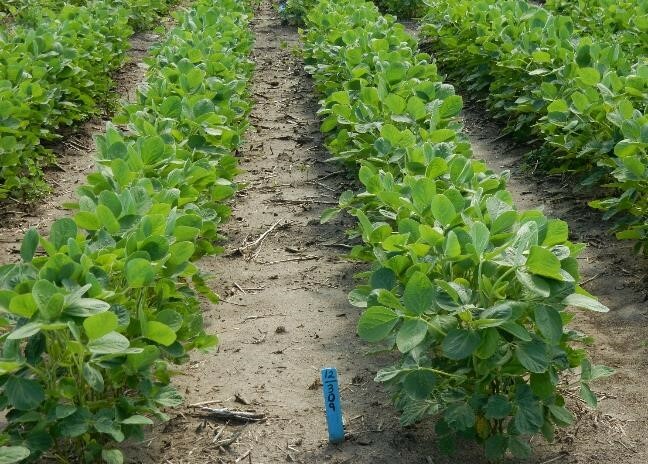 Soybean yield potential was still around 94 percent of optimal at the May 19th planting date, based on long-term U of MN research results (Hicks and Naeve), and the benefit was a much lower population of giant ragweed to control postemergence (Photo 1 and Fig. 1). In contrast, soybean yield potential of the early planting date averaged 99 percent of optimal; however, pre-plant tillage removed less than 8 percent of the giant ragweed emerged over the season. Pre-plant tillage can be an effective weed control tool, especially when planting is delayed. 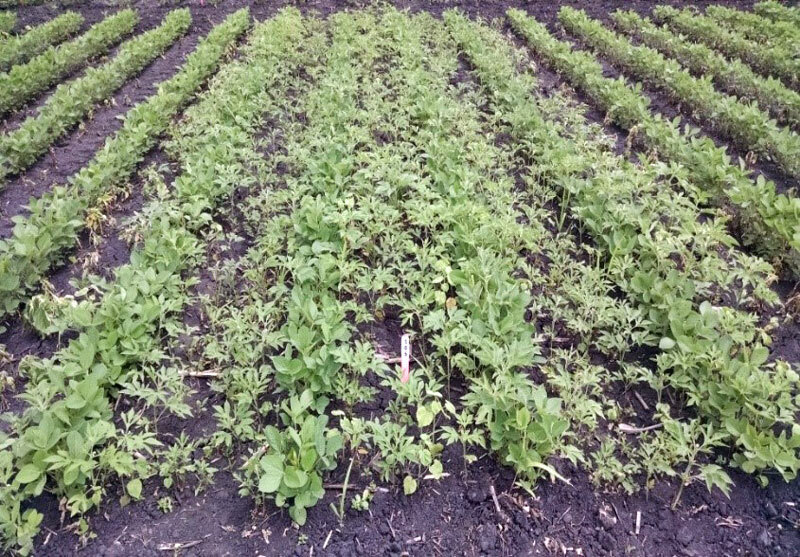 Flushes of early-emerging weeds, such as giant ragweed, common lambsquarters, and winter annuals, can be taken out with pre-plant tillage, but be sure tillage is aggressive enough to destroy the weeds, and not just uproot and transplant them. Figure 1. Giant ragweed emergence pattern and potential soybean yield during spring and early summer. 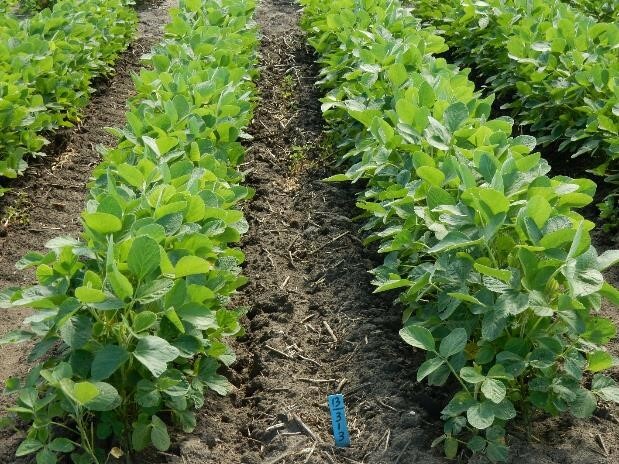 Soybean yield potential is based on long-term U of MN research data. Giant ragweed emergence data from Goplen et al. (2017a, b). For more details on this research, see the video Giant ragweed emergence patterns. Additional information is available at the Herbicide resistance management website. Figure 2. 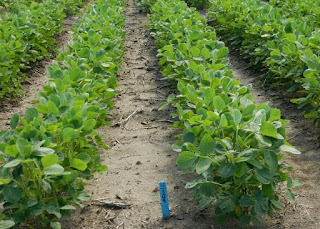 Concept of layering soil residual herbicide (PRE/POST) to provide season-long control of waterhemp populations in soybean. For more details, see Got waterhemp? 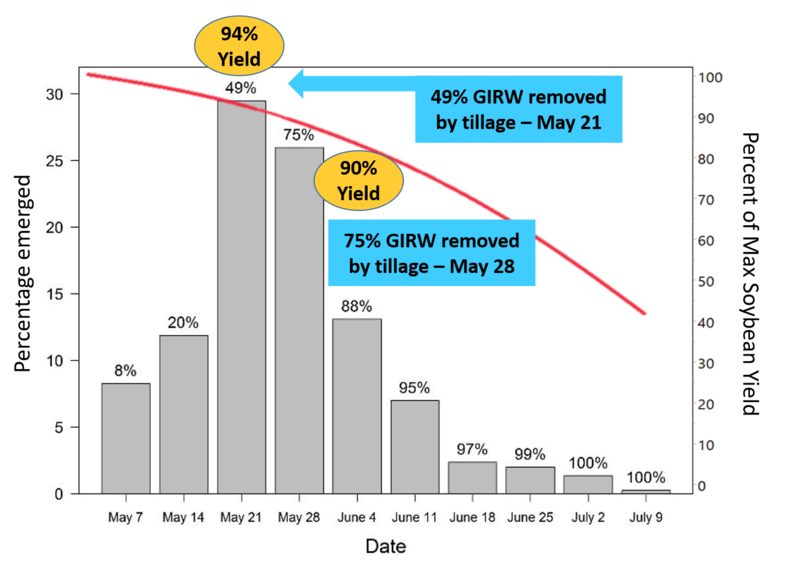 Layer residual herbicides to maintain control. Source: Lisa Behnken, Fritz Breitenbach and Ryan Miller. In contrast, waterhemp emerges later in the season, typically emerging over an eight to ten week time period. 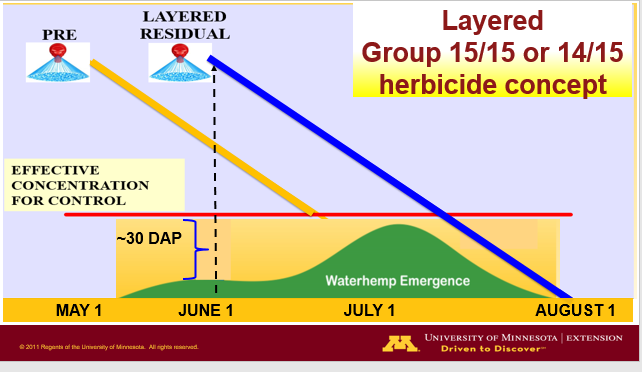 This is why residual herbicides or the layering of residual herbicides (e.g. an application at planting and then 30 days later) is recommended for control of waterhemp (Figure 2). Seed production of weeds can vary significantly by species. Giant ragweed, for example has been found to produce from 1,800 to 10,000 seeds/plant, while waterhemp can average over 350,000 seeds/plant. 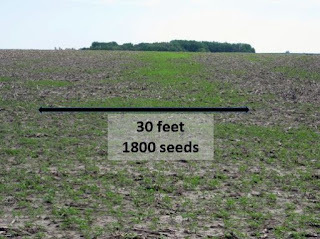 Although competition with other plants can reduce seed production per plant, dense weed populations have the potential to produce tremendous amounts of weed seed. 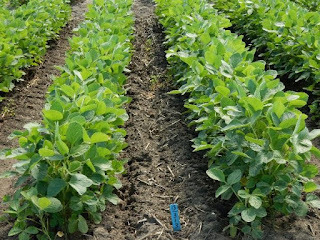 Considering that weed seeds can remain viable in the soil for years, one year of poor control can lead to significant weed control challenges for years to come. Common lambsquarter is a long-term survivor in the weed seedbank, and according to the University of Michigan, it takes an estimated 78 years to see a 99 percent depletion of the seedbank. 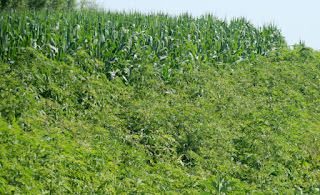 In contrast, University of MN research demonstrated that the giant ragweed seedbank could be depleted 97 percent in two years. University of Illinois research found the waterhemp seedbank could be depleted by more than 99 percent in 4 years. 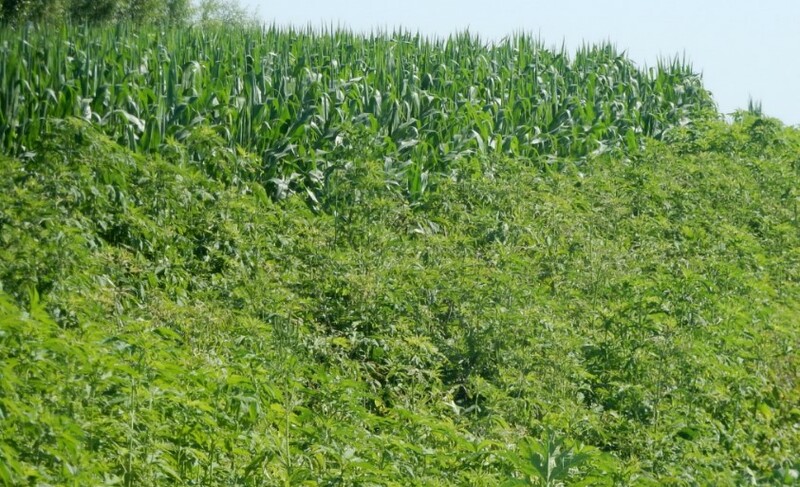 These results show that populations of giant ragweed and waterhemp could be dramatically reduced if weed seed production was prevented for 2 to 4 years, respectively. Burial of seed by tillage can increase longevity in the seedbank, while seed left on the soil surface can be lost to predation and decay. For this reason, delaying tillage as long as possible in areas where weeds went to seed could help reduce long-term weed management challenges by decreasing the number of seeds deposited back into the seedbank through seed predation and decay (Photo 2). Avoid deep tillage, which enhances seed longevity. Hand roguing of weed escapes can help prevent replenishment of the seedbank, but target pulling before viable seed is produced, unless you plan to bag and carry the plants out of the field. Species vary in how long it takes to form viable seed. Research by Bell and Tranel (2010) found that waterhemp could form viable seed 7 to 12 days after weed pollination. Seeds may also still mature on pulled plants if the plant pollinated before pulling. Regardless, NOT running the combine through a weed patch will help limit the spreading of weed seeds throughout the field (Photo 3). Also, manage weeds along field edges to help prevent buildup of the weed seedbank (Photo 4). For more details on the University of Minnesota giant ragweed seedbank research, see the following videos, Weed seed production and Seedbank depletion and zero weed threshold or visit Herbicide resistance management. Ensuring the crop is as competitive as possible (e.g. adequate fertility, planting population, and disease and pest control) can help enhance weed control. Narrow rows, expanding crop rotations, and cover crops have the potential to aid in weed control as well. Cultivation is another effective tool, allowing you to remove weeds without setting back the canopy as some postemergence herbicides can, leading to faster canopy closure and a more competitive environment for weeds. 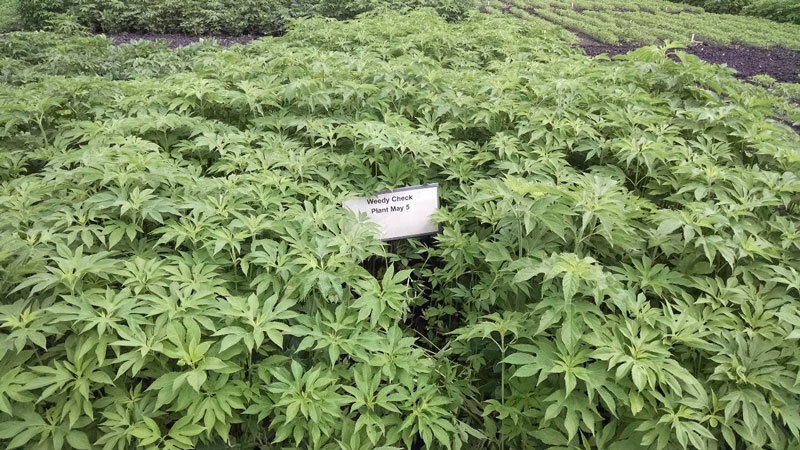 For example, cultivation was evaluated in U of MN research trials in 2015 and 2016. A preemergence application of Boundary (1.95 pt/acre) was followed by either Liberty (29 fl oz/acre) or mechanical cultivation. In 2016, final waterhemp control was significantly better with the Boundary/Cultivation treatment (98%) compared to the Boundary/Liberty program at 89 percent (Photo 5). 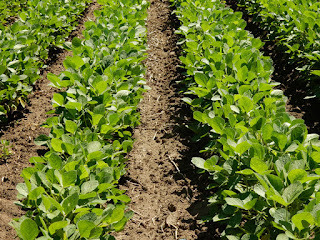 The soybean canopy also closed sooner where cultivation occurred, so waterhemp that emerged under the canopy in July after cultivation did not survive. In addition, both treatments resulted in similar yields to the top yielding treatment. Similar results for weed control, canopy closure, and soybean yield were found in 2015. 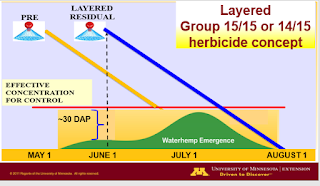 For more weed management research and information, check out the University of Minnesota Extension crops website at www.extension.umn.edu/crops and click on the "Weed management" link or go directly to http://z.umn.edu/weeds. To see more University of Minnesota Extension crop videos, visit www.youtube.com/user/UMNCrops. Goplen, J.J., Sheaffer, C.C., Becker, R.L., Coulter, J.A., Breitenbach, F.R., Behnken, L.M., Johnson, G.A., and Gunsolus, J.L. (2017a). Seed bank depletion and emergence patterns of giant ragweed (Ambrosia trifida) in Minnesota cropping systems. Weed Sci. 65:52-60. Goplen, J.J., Sheaffer, C.C., Becker, R.L., Coulter, J.A., Breitenbach, F.R., Behnken, L.M., Johnson, G.A., and Gunsolus, J.L. (2016). Giant ragweed (Ambrosia trifida) seed production and retention in soybean and field margins. Weed Technology 30:246-253.